Make the cookies: Preheat oven to 350 degrees. Line 2 large baking sheets with parchment paper. Whisk flour, baking powder, baking soda, and salt in medium bowl. In second medium bowl, stir together oats, pecans, cherries, and chocolate. In standing mixer, or using a hand-held mixer, beat butter and sugar at medium speed until no sugar lumps remain, about 1 min. Scrape down sides of bowl with rubber spatula; add egg and vanilla and beat on medium-low until fully incorporated, about 30 secs. Scrape down bowl; with mixer running at low speed, add flour mixture; mix until just combined, about 30 secs. With mixer still running on low, gradually add oat/nut mixture; mix until just incorporated. Give dough final stir with rubber spatula to ensure that no flour pockets remain and ingredients are evenly distributed. Divide dough evenly into 16 portions, about ¼ cup, then roll between palms into balls about 2 inches in diameter; stagger 8 balls per baking sheet, spacing them about 2 1/2 inches apart. Using hands, gently press each dough ball to 1 inch thickness. Bake each baking sheet 11 minutes, rotate them front to back and top to bottom, then continue to bake until cookies are medium brown and edges have begun to set but centers are still soft (cookies will seem underdone and will appear raw, wet, and shiny in cracks), 8 to 10 minutes longer. Do not overbake. Cool cookies on baking sheets on wire rack 5 minutes; then transfer cookies to wire rack and cool to room temperature. In a large bowl, beat butter until fluffy (about 1 min). Gradually beat in the sugar, one cup at a time, alternately adding tablespoonfuls of the milk. Whip on medium-high speed until the mixture is light and fluffy, about 3 minutes. Add more or less milk if you desire a thinner/thicker consistency. To assemble the oatmeal cream pies: Once the cookies are cooled completely, spread 2 TBSP buttercream on the underside of one cookie. 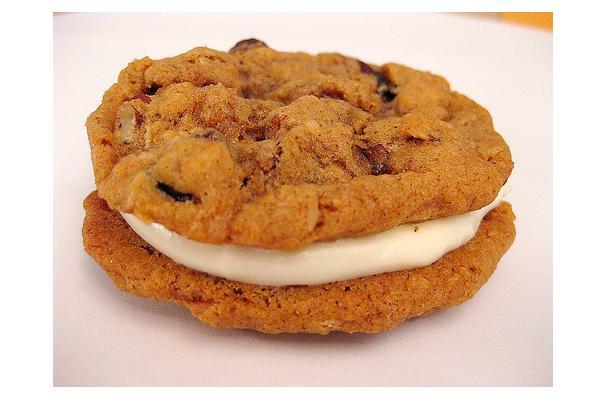 Top with another cookie and smoosh lightly to spread the cream to the outer edges of the sandwich. Enjoy! Cherry, Chocolate, and Pecan Oatmeal Cookie Recipe from Cooks Illustrated.